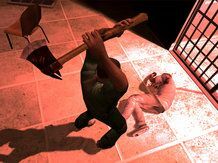 Manhunt 2, Rockstar's controversial sequel to 2003's Manhunt, has finally been given a UK release date, more than a year after it was released in the US. The game was suspended from launch in the UK and Ireland by its publisher TakeTwo after it failed to get a rating. This rejection by the BBFC – and the subsequent court cases to reject the, er, rejection – meant that the game was indefinitely delayed, despite being available to buy in the US since 31 October 2008. The game will now be released in the UK exactly a year after its US release, hitting British shelves this Halloween. The game was finally given a BBFC 18 rating back in March, after the Video Appeals Committee (VAC) overturned the decision to not give the game a rating – this was after some hefty modifications by Rockstar. Quite why it has taken half a year to get the game into the UK is unknown, but it does mean that Wii, PS2 and PSP owners can finally satisfy their virtual blood-lust on the scariest day of the calendar.